The Shows: Cult TV Drama and Cult TV Comedy. Produced: HTV West for syndication via ITV regions throughout the UK. The story begins with Arby a teenage boy, wearing the ubiquitous grubby 70's Parka, assisting at a pheasant shoot. When Arby heads off into the woods aiming to recover a pheasant for the masters of the shoot, he stumbles upon an otherworldly-looking youth - SKY, buried under leaves. Sky appears to wield a power that wills Arby to help him find safety. SKY convinces, an at first skeptical, Arby that he is a time and dimension traveler who accidentally landed on the earth at this time in the midsts of his journey to the earth of the future. To continue on his journey, he needs to locate the Juganet, a circle of power that aids travelers in their dimension / time jumping travels. SKY also makes Arby aware of his powers of telepathy, mind control and a psychic ability allowing him to physically manipulate objects. Despite his powers SKY is in peril. The forces of nature have sensed SKY's alien presence and, in turn, attempts to destroy him, by manifesting leaves to suffocate him and branches to tether him. With Arby's help, SKY fends off the forces - for now. Arby's sister Jane, discovers SKY with Arby and is let into SKY's quest to find the Juganet which will allow him to carry in his journey into the future time. In an attempt to gain knowledge of where the Juganet may be located, the trio head off in the dark of night to the school library, where they are joined by their friend Roy. Unfortunately, Roy's father, Major Briggs, (the master of the pheasant shoot) has tracked them down, believing the oikish Arby is leading his son astray. SKY uses his powers to temporarily disable the aggressive Major, who upon recovery promises to "sort this out once and for all". SKY becomes aware that the earth's forces are now increasing in strength against him, and that these forces will now manifest into a physical presence, and so, out of thin air, enters the dark and mysterious presence of Ambrose Goodchild. Goodchild attempts to harness the full power of nature to attack SKY, which all ends in SKY becoming dangerously weak and needing to be hospitalised. Whilst there, SKY connects with a patient Tom, a 'backward' man who picks up on SKY's telepathy and is able to see SKY's thoughts. SKY's condition improves and he uses Tom's uncluttered mind to help him escape, both from the hospital, and from the approaching Goodchild, and then leads them closer toward the Juganet. But, as the Juganet gets closer, and SKY's power increases, Arby finds his own life in increasing danger in glimpsing the future time. SKY - The Cult of... SKY. What a strange time the mid 70's were - three day weeks, power cuts, scruffy styleless fashions, but more importantly spangles, fizzy Orange Corona ("Every bubble's passed its FIZZical!") and 'Look-in' comic / magazine (quite literally the junior TV Times). Perhaps more strange was the fashion in TV circles for making kids TV drama series that appeared to be designed solely to scare kids witless. Many kids drama series at the time (The Owl Service, The Moon Stallion, The Children Of The Stones) seemed to take on an air of junior 'Hammer Horror' or 'The Wicker Man' lite, telling dark psychological tales of unnatural (or natural) forces threatening or preserving humanity, many with overtones of the olde religion / Pagan philosophy / stone circles etc, and associating itself with apocalyptic forebodings of the earth's destruction due to man's greed and the ill's of the modern world. 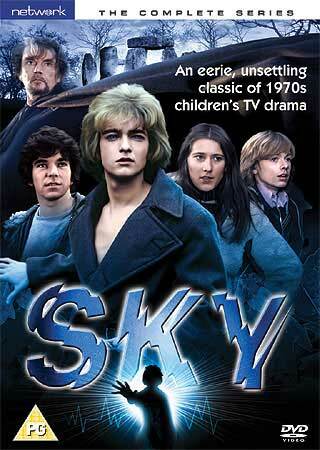 Of these children's drama's, one the very finest is the 7 episode serial SKY. SKY was written by Dave Martin and Bob Baker who together would write the esoteric and progressive Childrens drama King Of The Castle also for HTV (Baker would also go on to co-write both Dr Who and Wallace And Gromit stories). Made by HTV west (who would go onto produce Children Of The Stones and Into The Labyrinth), SKY was first transmitted on 7th April 1975, the first of seven episodes that would tell the story of SKY, a young time traveler who land on the earth, who subsequently attempts to resume his journey into the future. It is perhaps difficult to comprehend now, in times when there is a comparatively tiny output of children's TV drama being produced and schedules fragmented over numerous satellite channels, but children's programming in the recent past was an important part of scheduling. Not only were the budgets relatively generous, but the creative talent working on these productions were significant (let us not forget that Doctor Who itself was produced by the Children's Television department of the BBC). The 15 year period from the beginning of the 70s until the mid 80s, really was the golden age of children's TV, with some truly ambitious, children's drama being produced both by the BBC and the commercial networks (in particular HTV and ATV). SKY is one of the most accomplished and fondly remembered of those children's dramas from that period. The reason for SKY being held in such affection is undoubtedly in major part due to the wonderfully atmospheric storyline, which although perhaps is an episode too long, it is still an incredibly strong and thought provoking rumination on the notions of alien environments, lost or hidden knowledge / power and quasi-religious beliefs of the control that nature holds over man, all wrapped up in an engaging, and mostly exciting, sc-fi action adventure series. The production values are admirable, with budgets not in the same league as the BBC's set piece children's dramas, they still hold up in their shabby glory. The rudimentary use of special effects sometimes is over-reached in the ambition of the production, and in the 'terrifying' scenes of nature bringing its full force against SKY, oft times it looks like some rather brittle twigs being pulled along on invisible wire. On the other side of the coin, the use of Chroma-key to overlay effects onto scenery and, in particular, on SKY's skin, is really well actualised - especially considering that, at the time, the technology was still in its infancy. The action takes place in both studio sets (shot on video) and on location (shot on film). Some occasional continuity errors creep in i.e. the car accident scene where we flip between shots made on video and film about five times within a couple of seconds, which to the modern viewer especially, so used to seeing shows shot in one format only, seems incredibly incongruous. There is also a scene where the mic boom is evident in shot for most of a 2 minute scene. Some of the location shooting, however, is nothing short of spectacular, in that it manages to capture perfectly the powerfully eerie atmosphere of Glastonbury Tor, Stonehenge etc. Another underlying triumph is the hugely atmospheric, skilfully under-played soundtrack provided by Eric Wetherell, which seems to have been a template for future spookily atmospheric serials (such as Children Of The Stone). The sparse and angular instrumentation put together from an ensemble with a peculiar combination of instruments - those being a violin, harpsichord, xylophone and a mini-moog synthesizer - really does both heighten and punctuate the atmosphere of the piece enormously. There are a few cul-de-sacs that the series runs down, primarily the class-based friction between Arby and the Major (which is both a needless distraction within the context of the story, and is in any case not particularly well written anyway). To a lesser extent, the pacing of the episodes is also a problem, with a motionless (plot-wise) episode in the middle of the series and an ideas-packed final episode, which if the themes were successfully expanded upon, could have easily ran to two rather good final episodes. Those are but minor criticisms of an otherwise superb landmark in the history of children's TV drama. The quality and ambition of the series is no doubt why the SKY is so fondly remembered nearly 35 years since its first broadcast. Released by: network (Web exclusive release via Network's site). Since ever the internet has been at our fingertips, kid's TV shows have featured prominently on websites organising themselves around either reminiscing nostalgically about shows of the past, acting as a rallying cry to get old shows issued on DVD (or previously on VHS) or even those naughty torrent sites offering downloads of said shows. SKY has featured in all of those above. A few years back there was even a 500 signature petition flying around on the internet pleading for a commercial release of the series in time for the 30th anniversary of the show's first broadcast. Despite constant rumours of interested parties, nothing came of the petition, the 30th anniversary came and passed, and even the most ardent and optimistic fans feared that the series would never be commercially released. But on 1st June 2009, the wonderful cult TV and film label network gave SKY its first commercial release, with a superb DVD release. No doubt the stumbling block to commercially releasing SKY over the years had been due to the fact that, during a transfer from its 2" videotape onto film stock in the 1990s, episodes 3 and 7 were damaged beyond repair. Luckily a slightly poorer quality off-air video copy was available to ensure those two episodes were not lost for ever. The recorded quality of those two episodes stand up well under the scrutiny of modern digital equipment. There is of course the expected softening of the picture, a slight muffling of the sound and a practically unnoticeable tape hum, but the quality overall is very good for an off-air recording. The picture and sound quality of the other 5 episodes is excellent in comparison to similarly shot series shot and stored many years later than SKY. The disc menus are themselves very well presented, with some short but sympathetic and stylish between-menu animations, along with a nice custom background picture behind the Episodes menu. There are a couple of Extra features on the release. Firstly, there is a photo gallery containing both production stills and publicity shots. Secondly, there is PDF material which contains material from the original SKY promotional wallet, plus a PDF of a front cover and feature on SKY that originally appeared in Look-in magazine during the week that the first episode of SKY was transmitted. Another nice little feature that this release includes (along with many other of network's releases) is the inclusion of the production countdown clocks and clapperboards etc in their places at the beginning and end of the individual programmes. These are hidden from the point of playing the episode direct from the menus, but if you rewind prior to the start of the HTV idents you'll get to see these countdown clocks in all their glory. One small downside of the release is that the DVD is only available from the network website itself, and so it will not appear on those virtual shelves at Amazon and Play et al, which may perhaps hinder it in terms of visibility, but no doubt the word of (virtual) mouth that works so well on the interweb, will get the release to the attention of the many interested parties that will want to own this release. So more power to network for releasing this DVD, and their other terrific roster of titles which reads like a role call of the very best in cult TV - if only they could take charge of releasing the BBC archive too. In terms of cult TV, few kids TV shows gets more culter than SKY. Hopefully with the release of SKY on DVD, the show will reach out, not only to the devotees who have waited 35 years to see the show again, but also to a new generation of viewers who will be able to see what can be achieved with a mandate and a desire to make quality children's drama, a reasonable budget and a huge amount of skill and imagination.